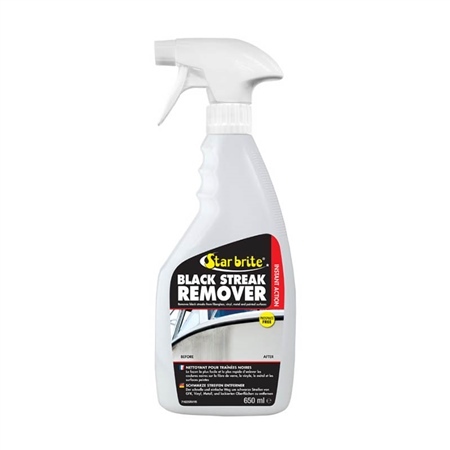 Black Streak Remover begins working on contact to eliminate black streaks under rubrails or anywhere else on the boat. In addition to being the best way to get rid of black streaks, this product is a great all-around cleaner for all marine surfaces and around the house. Ideal for use to remove black streaks or grime from fibreglass, metal, plastic, rubber, vinyl or painted surfaces. Directions Shake bottle before using. Spray Star brite Instant Black Streak Remover directly on stained area. Let application soak in for 30 seconds before using a clean cloth, brush or sponge to wipe away stain. Rinse well with water. Severely stained surfaces may require a second treatment and light scrubbing. Will not remove wax or polish; safe for fiberglass, vinyl, plastic, stainless, rubber and painted surfaces.